Steam-Engine Train "Nostalgia" takes you on the Sargan Eight narrow-gauge railroad tour cutting the mountains through numerous tunnels and bridges. Sargan-Eight (“Sarganska-Osmica”) is a picturesque section of the narrow-gauge (760 mm / 30 inches) railroad cutting through the mountain range near Zlatobor (Western Serbia). The “Sargan-Eight” was designed to provide the crucial link between Uzice and Visegrad connecting this way the Central-European network of railroads with the local line from Sarajevo to Dubrovnik on the Adriatic coast. For the Austro-Hungarian Empire it was also a strategic connection allowing for “more efficient” control of its southern territory bordering the long-time adversary – Ottoman Empire. Crossing the Sargan pass near Mokra Gora turned out to be a very difficult engineering task due to the rough mountainous landscape with deep valleys and steep slopes over the very short distance of 3.5 km (2.18 miles). 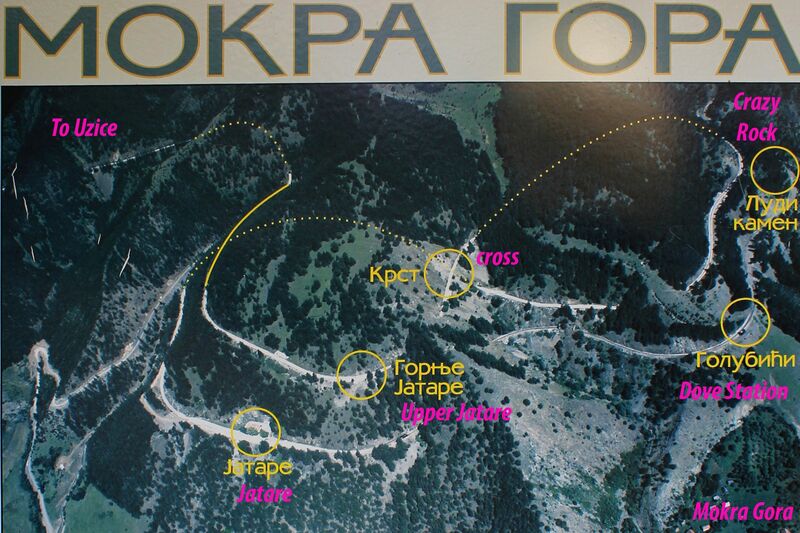 Above - view on the mountains range with the sketch of the Sargan-Eight railroad shape. To overcome these problems engineers proposed a very unusual layout of tracks in a form resembling the number “8”, extending this way the distance over which the train will have to climb the Sargan’s massif. Thanks to this shape the whole link gained this apparently mysterious name “Sargan-8”. The following sketches give some idea about the complexity of this crossing, clearly showing the characteristic pattern of “8” for tracks traversing the Sargan’s massif. Construction work started in 1916, however due to the disintegration of the Austro-Hungarian Empire as a result of WW1, huge technical challenges, raising costs and tragedies (death of more than 200 workers under the rubbles of the collapsed tunnel, suicide of the chief engineer…) the whole project was several times on hold. Drawing showing the outline and profile of the Sargan-Eight (no better resolution available). The final “attack” on Sargan’s massif re-started in 1921 and after almost four years of intensive construction works the first train crossed the mountains on February 28, 1925. 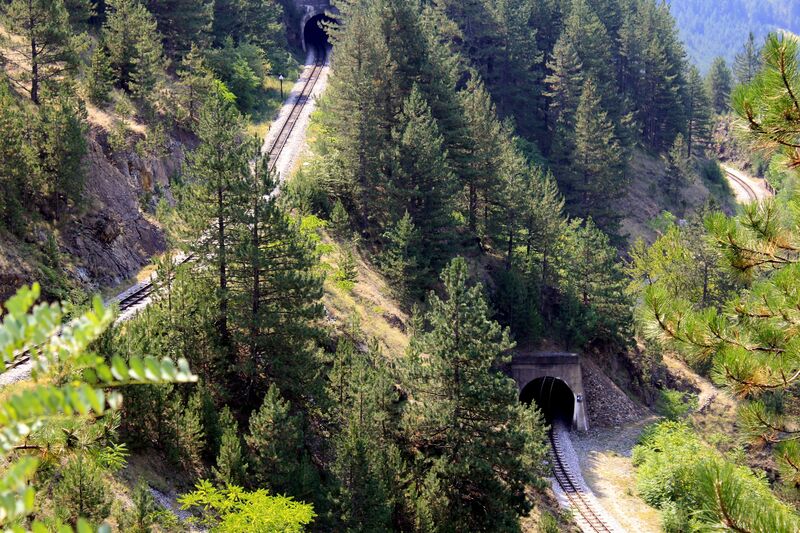 The most difficult part of the railroad including a loop along the Kamesina River and the famous path resembling the number “Eight” is 15.44km (9.6 miles) long. It includes 19 tunnels with the total length of 5.45 km (3.4 miles) covering more than 1/3 of the total distance and 10 bridges and overpasses. The longest Šargan tunnel (called King Alexander) has the length of 1666.80 m (1.04 miles). Without a doubt, after completion this unusually shaped network of tunnels and bridges climbing 356 m (1168 ft) has become an “instant” engineering marvel. It was also one of the most beautiful railway routes in the world and honestly it still keeps these reputations today. During the first half century of railway operation its “scenic assets” were overshadowed by economic and strategic importance of the link (obviously the time was not ripe for tourism). Frankly, for those traveling between Dubrovnik and Belgrade, the 2 days and 2 nights trip was rather an exhausting experience. Travelers remembering those days recall that some passengers would leave the train at the entry to “Sargan-8”, walk-down the hill, on the way picking-up mushrooms and blueberries in a kind of “stretching legs” exercise and then wait for the train at the lower section…. Sadly but understandably, those days there was no much room for what we learned to appreciate in recent decades - “ The Beautiful”….. Tracks and tunnels seem to lead from nowhere to nowhere in a somehow chaotic pattern and it is quite hard to comprehend that they are part of the same path. The second part of the 20th century brought the rapid development of the network of roads throughout the Europe changing forever the transport industry. The destiny of railroads, especially those slow and inefficient with a limited transport capacity was sealed. The last train crossing the Sargan-Eight left the station of Mokra Gora on February 28, 1974. Old steam locomotives - some already retired, some to the enjoyment of tourists still pull the carts along the Sargan-8. The whole section of the railway’s infrastructure between Uzice and Visegrad was abandoned; track and stations were either dismantled or slowly overtaken by The Nature. Fortunately some railroad carts and steam engine locomotives found their way to the local museums. Shutting down the Sargan-8, closed the colorful episode in the history of railroad, apparently forever….. . Certainly the Sargan-Eight (Sarganska-Osmica) was one of the most difficult to build railroads in Europe. It proved once again that for us, humans only sky is the limit. Fortunately with the closing of the commercial part of business the time did not stop here…. Indeed, it will be pitifully wrong abandoning to oblivion this stunning achievement of human imagination.